Geographers from the National University of Singapore (NUS) have found that coastal vegetation such as mangroves, seagrasses, and salt marshes may be the most effective habitats to mitigate carbon emissions. The study, which was conducted by researchers from the Department of Geography at the NUS Faculty of Arts and Social Sciences, indicates that nations with large coastlines could expand these ecosystems to further counteract their fossil fuel emissions. These findings were published in the Royal Society journal Biology Letters on 24 October 2018. With the recent Paris Agreement setting a target for all nations to become carbon neutral in the future, utilising these natural ecosystems could help to achieve this goal. Coastal vegetation, known as a "blue carbon" ecosystem, can grow fast and has the ability to accumulate organic carbon in the water-saturated soil that surrounds it. Therefore, blue carbon vegetation like mangroves are able to store carbon more efficiently, in a way that other ecosystems such as tropical rainforests are not able to. On a global scale, the impact of blue carbon is diminished, due to the limited range of these coastal regions. In fact, just 0.42 per cent of the global human-induced carbon emissions in 2014 were mitigated by these ecosystems. However, for countries with extensive coastlines, moderate carbon emissions, and limited deforestation, these habitats could be effective at counteracting some of the fossil fuel emissions caused by human activities. The study revealed that for Nigeria, Colombia, and Bangladesh, which are among the top 50 fossil fuel emitting countries in the world, mangroves alone mitigated more than 1 per cent of their national carbon emissions in 2014. "In 2014, Colombia hada mangrove surface cover of around 1,700 square kilometres and generated carbon emissions of 23 million tonnes every year. Our study suggests that mangroves mitigatedalmost 260,000 tonnes of these emissions annually. If national carbon emissions were to be reduced and mangroves protected and restored, this percentage would become even greater," explained Dr. Pierre Taillardat, the first author of the study who conducted the research while at the NUS Department of Geography, and in conjunction with the NUS Tropical Marine Science Institute. "We thought that this approach would be interesting for countries like Indonesia and Malaysia, due to their extensive coastlinesoccupied by mangroves. However, the high rate of mangrove deforestation in both countries is actually reducing the importance of this natural carbon sequestration process," Dr. Taillardat continued. As such, mangroves were found to be a source of carbon to the atmosphere in Malaysia, because when they are converted to other land-uses, this remobilises the long-term stored carbon and produces carbon emissions. Similarly, in Indonesia, mangroves only mitigated 0.4 per cent of the national carbon emissions in 2014 because mangrove deforestation offset much of the carbon soaked up by this ecosystem. However, Assistant Professor Massimo Lupascu from the NUS Department of Geography, and one of the co-authors of the study, claims that if mangrove deforestation was stopped, they could potentially mitigate around 1.6 per cent of the natural carbon emissions of Malaysia. In Indonesia, it would be even more impactful, mitigating approximately 2.6 per cent of manmade carbon emissions. The results suggest that the conservation and restoration of blue carbon ecosystems is a direct way to mitigate the effects of climate change, in addition to all the other benefits that these ecosystems provide to people. 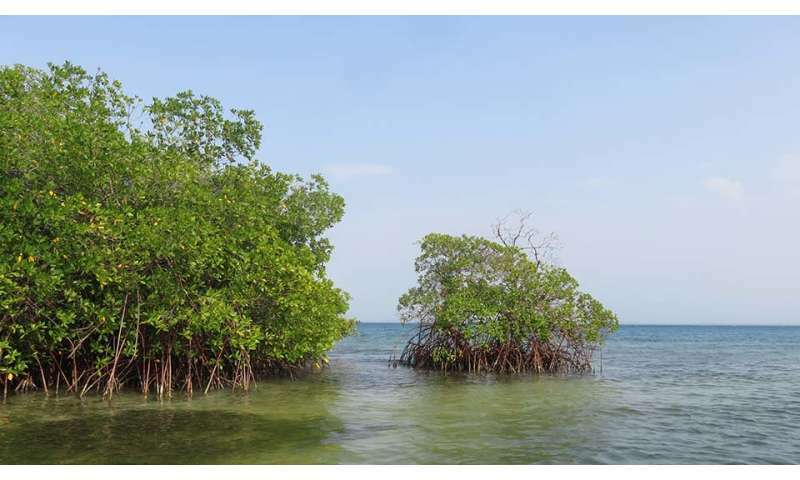 The revelation that mangroves and other blue carbon ecosystems are such efficient collectors of carbon has triggered the scientists behind the study to push for their protection. "Mangrove restoration does not have to be difficult. If done correctly, it takes only a few years to begin growing a forest of new trees.By creating conditions that are similar to those found in a natural forest, for example, the right amount of tidal flooding, it is possible to expand mangrove habitats and soak up more carbon," elaborated Associate Professor Daniel Friess from the NUS Department of Geography, who is another co-author of the study. Ultimately, this research could influence how individual countries uphold their end of the Paris Agreement, which states that nations must remove as much carbon as they emit by 2100. The researchers believe that expanding blue carbon ecosystems could make this goal more achievable. Dr. Taillardat remarked, "Considering the high competition between land-uses and the lag time before economies become fossil fuel-independent, conservation and expansion of ecosystems with high carbon sequestration potential is one low-cost option which can contribute to this Paris Agreement commitment."